I've been fixing a small trap hook hole today that was made on the Y&Y Test sail day. Pete must have rolled in on the hook on one of his 2 capsizes. The decks are 3mm ply so care when getting back in from the water has to be taken. I have been getting in over the stern as there is a nice, hard carbon transom tube that takes the trap hook knocks that are inevitable when getting back in. The good thing about having to do this repair is that I am going to take the opportunity to put a layer of glass (maybe carbon) on the side decks. As this has made me realize that when I loan out the boat to less experienced youth sailors that this is likely to happen regulary. So adding some protection now should help make the boat more robust in this situation. Adding the glass shouldn't add much weight and visually it will not spoil the look of the boat as I intend to cover the side decks with Pro-Grip, covering over the glass. Today I came up with a neat way of keeping tension on the string that held the plate that I stuck under the side deck hole and then filled. Having cleaned the hole up in the ply, I sanded the edges to a 45^ angle to make a bigger contact area for the epoxy filler. I then shaped a bit of carbon plate to fit into the hole on the diagonal. This allows the plate to have enough overlap to be stuck to the under side of the hole. I drilled a small hole in the middle of the plate, threaded a small length of plastic coated garden wire through the hole and the applied my mixture of epoxy filler to the plate. I posted the plate through the hole and pulled up on the plate to stick the plate to the underside of the ply side deck. 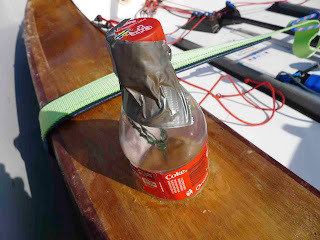 To keep tension on this I cut an old plastic soft drink bottle in half, made a hole in the lid and threaded the wire through the hole and applied tension and tied of the wire. A neat way of keeping the tension on the plate without tying string to garage rafters etc. Especially helpful if you are doing this sort of repair at your sailing club!